The Cruel Prince: The Folk of the Air (2018. 370 pages) is a new young adult fantasy novel from Holly Black. This ‘fish out of the water’ tale predominantly follows Jude. Unknown to the three sisters their mother was previously married to a general of the court. Madoc is violent enough to kill his estranged wife, especially for taking his full blood child Vivienne, but is honourable enough to take in the other two girls as well. We pick up the tale ten years later, when the girls are now young adults, and find that life for a mortal in Elfhame is not particularly pleasant. Vivienne, being a full blood fairy is accepted, although she refuses to conform, still rightly blaming Madoc for her mother’s death. Taryn, is the seemingly timid one who want nothing more than to fit in with Elfhame, hoping one day to gain acceptance through marriage. Our POV character is Jude, feisty and strong she is not one to bend to the caprice of the fairies no matter how much that taunt and misuse her. Jude dreams of being a Knight in one of the great courts, feeling that this is the way to find strength and protection. 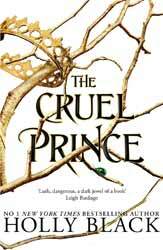 So, who is the cruel prince? At the beginning of the book the focus rests on Cardan, as sort of a tamer fantasy Joffrey Baratheon, if Joffrey were not fantasy already and one of the three princes vying for the throne. He spends his days in idle pursuits and plays cruel games with Jude, encouraging his companions to do the same. They subject her to daily humiliation and sometimes their games take on a deadlier feel. Black, however, prefers a more nuanced approach to her characters and the role of the cruel prince becomes somewhat opaque. When Jude finds a sort of employment with one of Cardan's brother, prince Dain as a spy, the reader does start to question his motives, which comes fast on the heel of a big reveal for Cardan. Jude is chosen as a spy as the faerie cannot lie, also as a human she can blend in with both the high born and the servants. How much you're going to like the book depends very much on how much you enjoy spending time with Jude. Feisty she may be, but she is also somewhat broken, and the character's inner monologue can start to feel a bit repetitious. I didn’t think that I was going to like the book as much as I did. Black, whilst including gender fluidity, only occasionally touches on the girl’s gender as a main plot point. For the most part her characters remain rounded and, apart from the caveat about Jude’s inner monologue, interesting and engaging. There is a lot of palace plotting to get your teeth into and some nice character development which makes you question your original feelings for different characters. The book also has an end that you will never guess. So, a strong entry for a new trilogy and an enjoyable young adult fantasy novel.